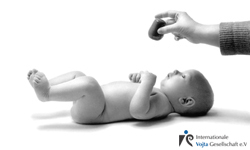 Fundamental aspects of normal and disturbed motor development in children in the first year of life with reference to Vojta’s neurokinesiological diagnostics. The new-born already possesses a clearly defined and therefore predictable repertoire of patterns of movement. They are an expression of man’s phylogenetic development. At the moment of birth however, these “motor programmes”, provided by the central nervous system, can initially only be realised in a limited way as more goal-directed movements. Thus, the new-born cannot yet e.g. raise its head, support itself on its elbows in a prone lying position, turn over, grasp in a targeted way etc. In a healthy child, the innate patterns of movement appear, as a rule, within the first year of life, as it constantly seeks to reach more distant targets. In so doing, it must deal in ever more varied ways with gravity, which acts on human beings under normal conditions. The extent of what can be reached at any particular point in development is determined by the level of uprighting against gravity. Expressions of this are e.g. symmetrical elbow support, single elbow support, sitting, standing with support, walking freely, hopping on one leg etc. The particular level of uprighting against gravity is characterised by a precise and coordinated relationship with postural and movement components. When assessing movement, the postural component has great, though in practice often neglected, significance. This quote applies here: “Each movement begins and ends with a posture. Posture follows movement like a shadow,” (Magnus, 1924). The postural component constantly gains on the movement component as the level of uprighting against gravity increases. In Vojta’s neurokinesiological diagnostics, the postural and movement components are assessed in their overall relationship (as a so-called “global pattern”) and against the backdrop of the level of uprighting against gravity that has been reached. First of all, the child’s spontaneous movement in a supine lying position and a prone lying position is evaluated. 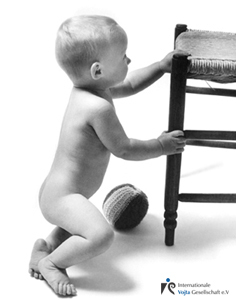 Quantifiable evidence for the level of uprighting against gravity that the child has reached and the quality of the global pattern is acquired through testing the seven postural responses. On this basis, a relationship between the result obtained and the best possible quality, the “ideal pattern”, is established. Deviations are designated as “disturbances in central coordination” of varying degrees of severity. An assessment of the examination results with reference to their significance for prognosis (from which Vojta physiotherapeutic treatment can also be indicated) distinguishes between especially adaptable disturbances in central coordination, the onset of cerebral palsy and manifest cerebral palsy. Following the course of the examination, it is possible to reach a clear and reproducible development assessment for a new-born baby in a short period of time, such that will allow an assertion to be made about the developmental age reached and the degree of threat to development. The precise definition, the inaccessible or only partially accessible segmental pattern, (according to Vojta: the blocked segmental pattern) in posture and movement determine the therapeutic approach. This, by means of a targeted supply of excitation to the central nervous system, is directed towards “unblocking” and thus gaining access to patterns of movement that, in the developmental sense, are normal or approaching normality. The effect of the treatment is dependent on it starting early, the degree of damage, the extent of the "blockage", the exercise intensity and the efficacy of implementation. As a rule, parents are instructed and supervised in the treatment technique for their child by a specially trained physiotherapist. Parents take on a significant share of the therapy, which can extend over several weeks at least. At the beginning of treatment, targets are set based on the diagnosis mentioned above. These are determined according to the results. Even in patients with manifest cerebral movement disturbances, the level of uprighting against gravity can be described unambiguously. In this way, it is possible to point out analogies to developmental stages that belong to a specific age as a part of normal child development. Such an approach is e.g. helpful in creating rehabilitation concepts, whose targets and efficacy can be specified further on.